The season is just about to start. You're slowly walking through the woods, looking closely at the bottom of every oak and beech tree for Sheep's Head mushrooms. You want desperately to find the first one and all of a sudden - wham! - there it is, or sometimes 'there they are! How did you get so close to it/them without seeing it/them from afar. It's amazing how such a big thing can be so well hidden. A closer view of what you want to find. 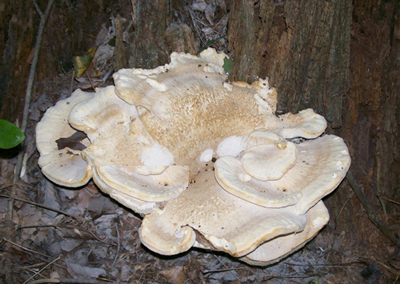 Many lobes / caps, spoon shaped, on several branching white stalks arising from a main base - and thin fleshed. Color can vary - depending on conditions. Below is a light gray variety. Ten pounds. Finding big Sheephead is not a rarity. Just make sure they are not too old and/or getting tough. If you find one like this leave it alone. 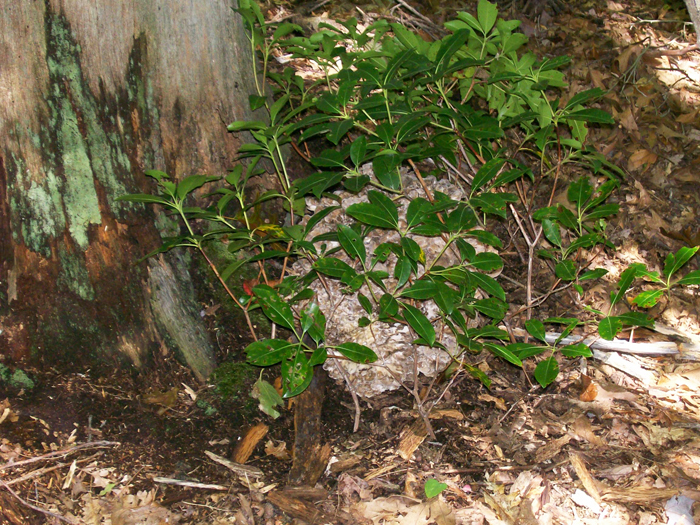 Someone has hidden it by sticking rhododendron branches nearby and is waiting for a better time to get it. Here's another color variation. Light tan. Click on the photo to see another color variation. Here's my pride and joy. 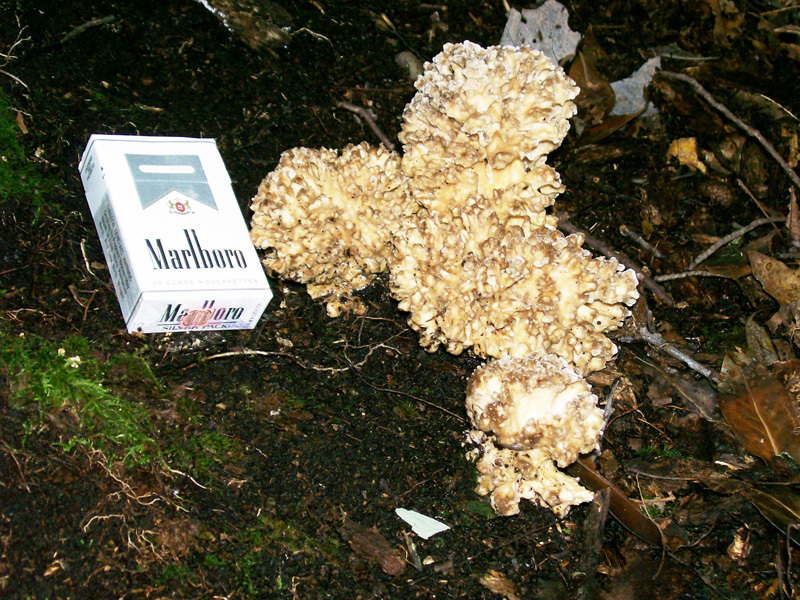 A rare white Maitake. The boot is size 13. This turned out to be a 12 pound specimen in excellent condition. Finding them when they are 7 pounds or more is a bit easier than when they are little babies just starting out in life. Check this one. It is not much bigger than a AA battery. September 7 at approximately 12 ounces. September 17 at 9 + pounds. Here it is being held by my friend Tony. Note there are no gills on Sheepshead. They have a multitude of very tiny pores ( poly ), hence their Genera name - polypore. The underside is white. White spore print. 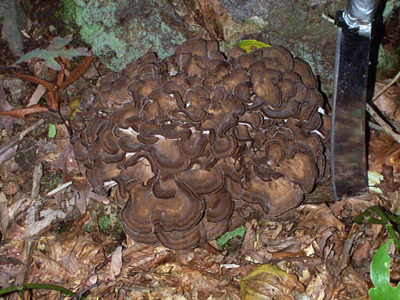 Sheepshead do not stain black like the 'Black Staining Polypore', pictured near the bottom of the page, and which is often mistaken as Sheep's Head by novices. Find them growing at the base of trees and/or stumps - preferably oak, but also found on big old beech trees and other deciduous trees. Here's four around an oak. However, don't be surprised to find them a bit higher on a tree. Here is a double batch growing a couple feet above the ground. Although rare, it does happen. Thirty five years of wild mushroom foraging and this is only the second time I have seen this. Click on the photo to see a close-up. Best practice is to use a large sharp knife and carefully cut the base from the ground / tree. If you are careful with removing the Sheephead it will grow again for the next few years - as long as the nutrients are still present in the tree and the weather conditions are condusive to its growth. Notice the large knife I use in the photo of the dark brown variety 2 photos above. 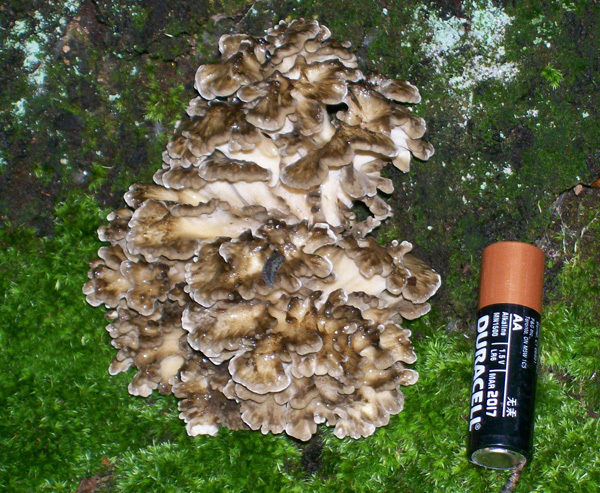 For the Hen-of-the-woods lover there is nothing that will give you more mixed feelings than being far away from your vehicle and finding several 5 to 15 pound specimens. 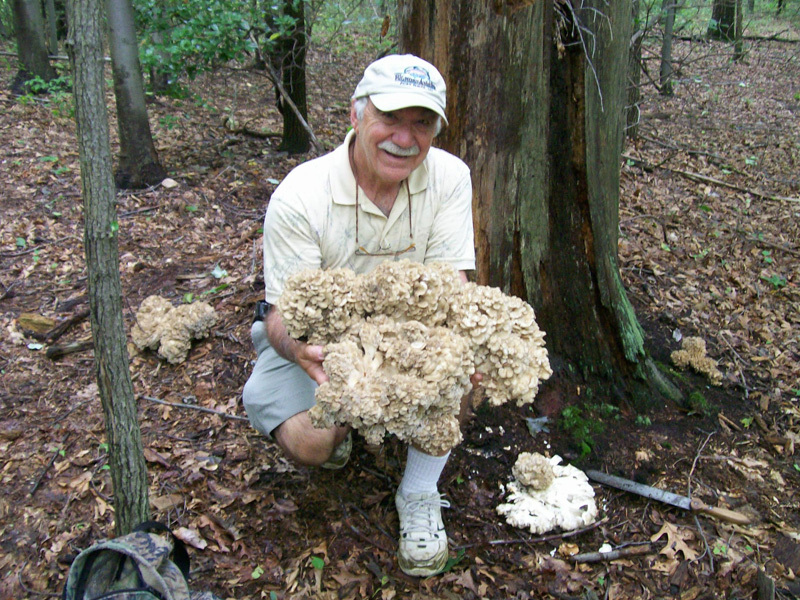 I recall once, back in the early 90's, I was younger then too, when it was all I could do to get three of such mushrooms back to my truck. They were heavy and fresh. It was before GPS so I knew if I did not take them I might not find them again. Even with many rest breaks on the way back to the truck I was beat. The beer(s) never tasted better than they did that day. Then when arriving home the processing of all those Hen-of-the-woods mushrooms ( dehydrating the caps and simmer/freeze the rest ) kept me busy for a long time. This is NOT a Sheep's Head, although it looks very close. If it's like the one in the photo above you will be dissappointed. 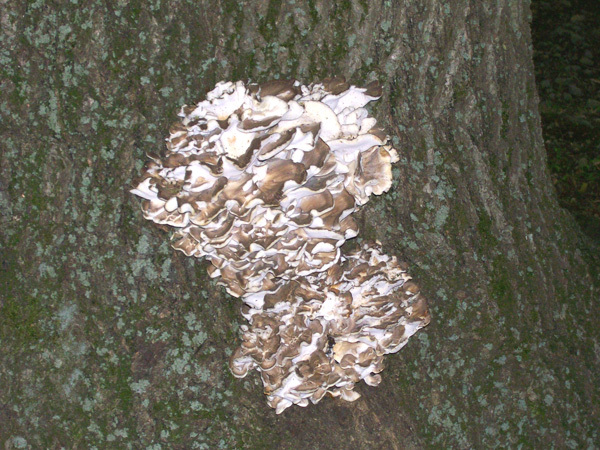 It's a ' Black Staining Polypore' (Meripilus giganteus ). 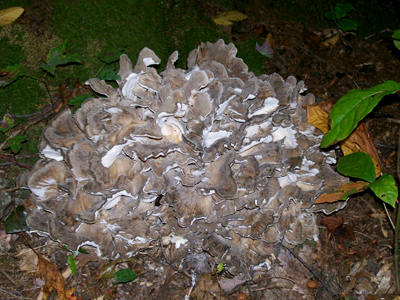 Although edible, it is far from being a choice morsel like the Sheephead. 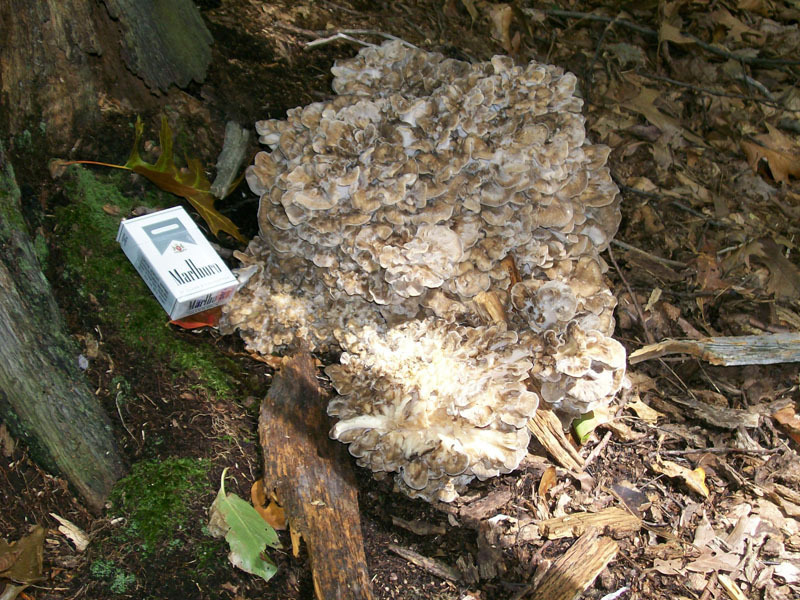 More than likely, if you find it and it is large, it is probably too tough to eat. Edible while very young and while still a bit squeezable but not great. Unfortunately, people that are anxious and not that well informed about polypore type mushrooms have picked these 'Stainers' thinking they found a Sheephead. There can be a lot of similarity so it's understandable that such errors can happen. They take it home and prepare it like other mushrooms and find out that it's a bit on the chewy side and not that tasty. They then have a false impression about the quality edible that the Sheephead is. Some of these folks will never know that they were eating something other than a Sheephead. 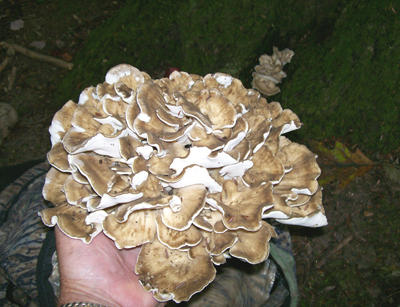 Here is another one that gets mistaken for Sheepshead on occasion - ' Berkeley's Polypore ' ( Bondarzewia berkeleyi ). 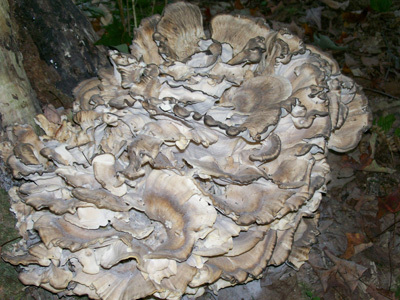 However, Berkeley's Polypore has large pores and thick, larger caps - almost the way Oyster mushroom shelves overlap each other. 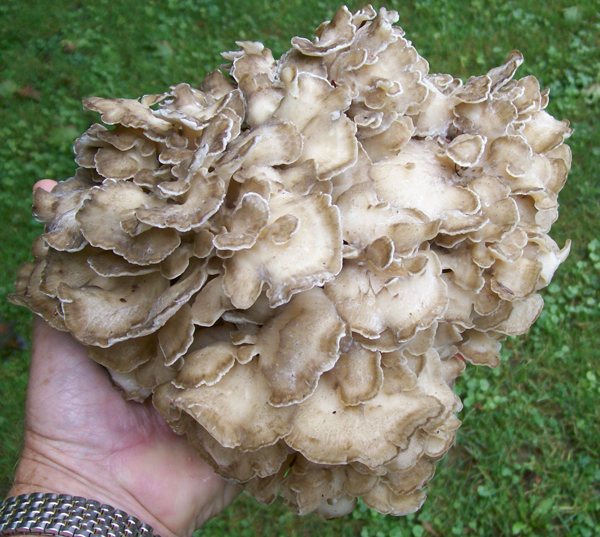 I sell Maitake every year during the season. Portion size is per pound @ $5.00. 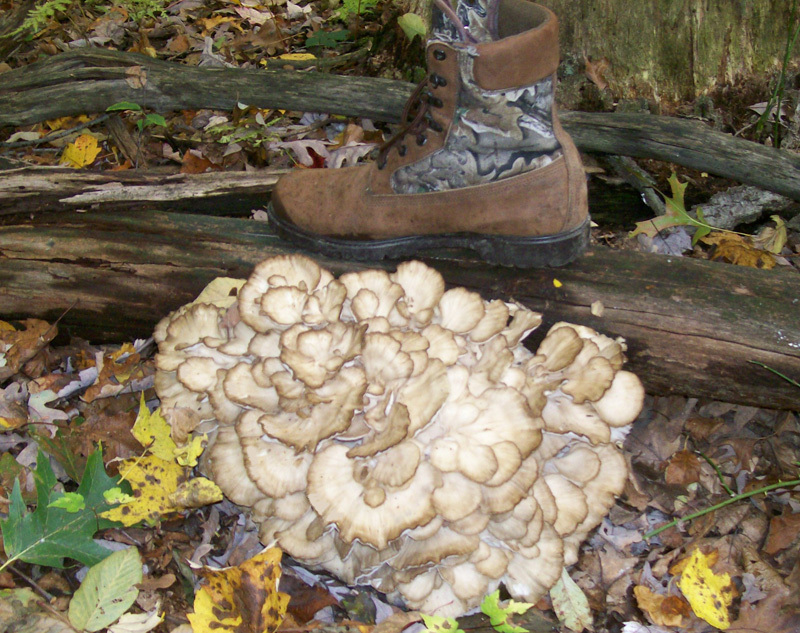 Click here for more information on purchasing fresh, whole Hen of the Woods. DATE - September 19, 22, 24 and 27, 2009. The Fall of 2011 was a great year. I found 49 by the end of September. FOUND - Linn Run State Park, Kregar( Camp Run area ) and Stahlstown, Pa. area. 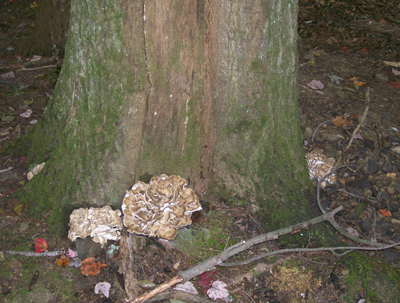 Four were found around the base of an oak. 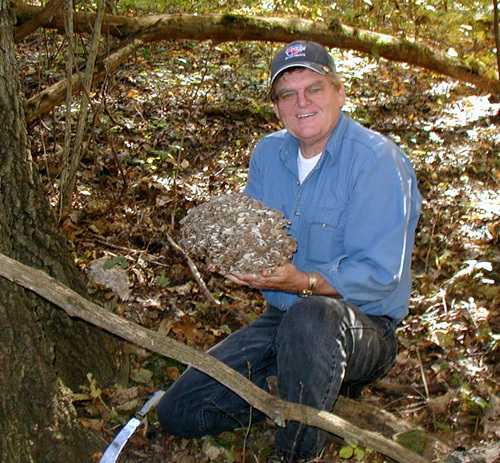 Two grayish samples, 6+ pounds and 10+ pounds, were at the base of an oak. 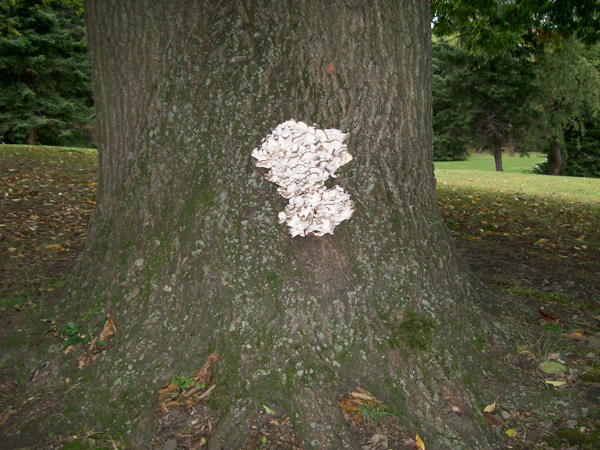 Several single Sheephead were also found at the base of an oak. Weather conditions: Damp. However I would characterize the two weeks prior to finding them on the dry side.